Trollhunters is a made-for-Netflix animated series. 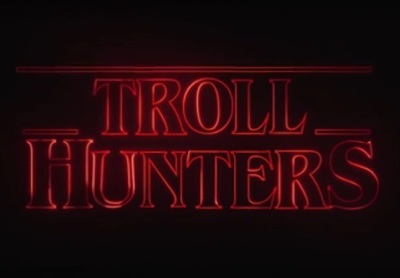 This is a spoof trailer, mashed with another Netflix series, Stranger Things. Trollhunters features voice-acting from Anton Yelchin, Kelsey Grammer, Lexi Medrano, Fred Tatasciore, Charlie Saxton, Jonathan Hyde, Victor Raider-Wexler, Steven Yeun, Amy Landecker, Cole Sand, Matthew Waterson, Thomas F. Wilson, Ron Perlman, and Ike Amadi.